Maker: Sheaffer. You may be looking for a different model of Sentinel, depending on vintage; there are the Touchdown and the Snorkel versions to consider, as well as a much later model of the same name which is not part of a larger line. This page refers to the Triumph era version. While I don’t have any evidence for this notion, I don’t think the Sentinel would have appeared prior to the 1945 re-laying of the line, due to the substantial requirement for steel in the cap which would have been looked at somewhat greenly under wartime metal constraints. As it happens, the Sentinel was a late inclusion into the line-up in any event, not showing up until 1947. One assumes that this design was a response to the Parker “51” and its steel cap, since previously the choice in Sheaffers was either plastic or gold in varying presentations, but it may also have been a move to provide extra visual interest in the line-up with the shift from celluloid to the less explosive but also less decorative Forticel plastic. There were a couple of variations in this steel cap: earlier ones appeared in a frosted pattern (much like the “51”) and were more properly known as Sentinel De Luxe, while later ones had a mirror-finish with decorative lines running down the length. Production Run: 1947 – 1948. Size: 13.1 cm long capped, 15.0 cm posted, 11.4 cm uncapped. Point: 14k gold triumph with platinum mask. Filler: Vacuum, capacity approx. 1.2 ml or lever, capacity approx. 0.9 ml. Sheaffer Sentinel De Luxe, with matte-texture cap. The white dot is on the tip of the blind cap. 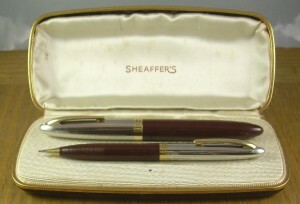 Sheaffer Sentinel set, vacuum-filler. This set is from 1948, as there was a very narrow window in which Sheaffer had learned to get the dot onto a metal cap (mid-March, 1948, according to the powerful Sheaffer scholar Daniel Kirchheimer (Kirchh on the Fountain Pen Network)) but before they transitioned into Touchdown fillers. The set in its box. This is morality-neutral MOCK alligator; the shape of case Sheaffer was using in the late ’40s is extremely attractive.